Okay, so: your first semester is pretty much done. Congratulations! That, in itself, is a really big thing. As you know, the high school > uni transition can be pretty daunting, and there are a lot of uncertainties flying around. You never really know what it’s going to be like until, well, you do it. Even now, there are probably things you take for granted that you were stressing about just a few months ago. But I’m sure there are things you’ve learnt from the experience, too. And these things can be amazingly valuable moving forward through your degree. It’s important not to ignore them, or to sweep them under the rug. 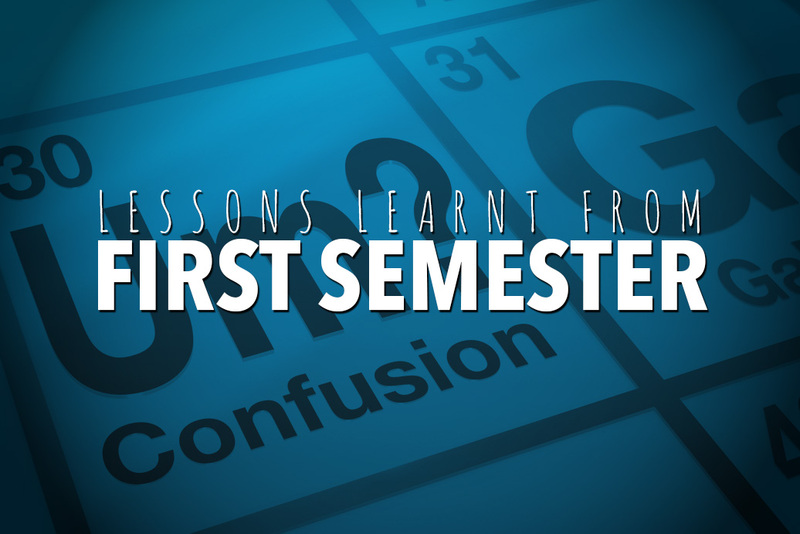 Here are some things you might think about when your first semester is all said and done. When you get time, you might like to sit down and reflect on these things. What have you learnt that you can implement or build on through your next semester(s)? Through first semester: what have you learnt? Let’s start with some academic stuff. Hopefully, after your first semester of uni you’ll have a firmer understanding of the expectations that are placed on you as a university student. What standard of work do you need to be producing? How late can you feasibly walk into a tutorial? How should you be speaking to your tutors and lecturers? The standard of work is higher. To be expected, of course. The jump, for me, wasn’t necessarily huge – but it was noticeable enough to think, “okay, I really have to up my game here”. There seemed to be a much bigger emphasis on critical thought and analysis rather than just regurgitating definitions and the like. This is a good thing – it helps you develop your analysis skills – but it can be a difficult transition to make. Your marks in first semester should give you a decent indication of how you’re faring. If you’re disappointed with your marks, recognise that you have the vast majority of your degree, and also recognise the fact that you certainly won’t be alone. A lot of students walk into uni on the back of pretty good high school results, and get brought down to Earth a little when first semester marks are released. If you’re stoked with your marks, great work! But try not to rest on your laurels; the expected standard will only increase again, and you can’t expect to cruise through and get great marks for your entire degree. You can get away with more in first semester than any other time. There’s more flexibility in the way you consume information. For example, you might have the option to listen to lectures online from the comfort of your kitchen. What is this witchcraft?! Imagine being able to listen to high school classes from home! Having this option is a blessing for some people, because it makes the whole experience much, much easier to deal with. But for others – myself included – it’s almost a trap. You start to listen to a lecture or two from home, you let yourself fall behind, and all of a sudden you haven’t physically made it to class since Week 2. Not good, and something you’ll learn to balance. You really need to start assignments early. For me, uni workload sort of went in cycles. Pretty chill start to the semester, then things would ramp up with the first round of assignments, then chill for a bit, then more assignments, then h e c t i c through SWOTVAC and before exams. Rinse and repeat. If you’re studying a degree where you tackle multiple units at a time, you might wonder why all of those units seem to have their assessments clumped together. It’s just the way it is. For that reason, being on top of your work is really important, and ensures you don’t leave yourself with an insurmountable mountain come SWOTVAC. If you struggled with that through your first semester, think about what you can do to avoid it in the future. Perhaps you should set up an assessment chart in Week 1, or invest greater energy into assignments when you first receive them. Small changes, but potentially big dividends! Referencing is now a thing. And by referencing, I don’t just mean listing “Google” under your bibliography, as might have been the case in Grade 4 haha. Referencing is serious business at uni, and you have to get it right. For one thing, you can lose easy marks if you don’t take it seriously. And trust me: submitting a killer assignment only to be penalised for something seemingly minor like using the wrong referencing style – that’s pretty frustrating. You can usually avoid this by stringently reading the assessment guidelines, or perhaps the unit guide. Everything you need should be listed, and there are countless guides online to help you with your referencing (whether you do it manually or through referencing software). But more broadly than that, referencing accurately ensures academic integrity, and that’s precisely what you want in your uni work. Ignorance isn’t considered a suitable reason for plagiarising (intentionally or otherwise), and it’s so much easier just to do the right thing. Seriously, it’s worthwhile learning. Again, you tend to get a bit of leniency through first year – particularly in your first semester. It’s pretty widely acknowledged that some students simply wouldn’t have referenced like this at all before. But you lose that leniency the further you progress, so learning how to reference really solidly now is a bit of a uni hack. Well, it can be, at least – but you need to learn how to deal with it. You might have had heaps of group work in your first semester; you might have had none. Either way, think about some strategies you can implement in the future to ensure effective team management. More and more, tertiary education seems to be focusing on this type of assessment, and interpersonal skills are useful in all walks of life. P.S. Shouting “WHY WON’T YOU JUST DO YOUR WORK?!?!? !” at your team members probably isn’t the best way to go about it. First semester exams: what have you learnt? Another hurdle you’ve probably crossed is ~~~university exams~~~. They’re really not too different to high school exams – perhaps just on a slightly larger scale. There were a few things I learnt from my first uni exams, but I’m sure you can add on to these with your own! It’s actually not that unfamiliar. This might depend on what your high school exams were like, but one of the biggest realisations I had was thinking, “hey, this actually isn’t so bad”. It was all pretty similar, albeit on a (much) larger scale: lots of angsty students, invigilators walking up and down the aisles, people trying to cram information in outside the exam halls. All the usual stuff. Probably the biggest difference for me was the sheer scale. I actually had to find the location, for one, and then find my seat within that location. That’s probably what caused me the greatest amount of angst. You get used to it, though; by the time I was sitting my last ever uni exam, the whole thing felt old hat. All the same rules apply from high school exams, too: prepare well, and you’re putting yourself in a great position to score well. Preparation throughout the semester is 👌👌👌. Speaking of preparation, it turns out consistent preparation through the semester is probably the best way to go. Who knew? Okay, so, you probably all knew that already – but it needs to be emphasised. It’s understandable to push everything to the side throughout semester and try to focus simply on what’s right in front of you at the time, but a little bit of concerted exam revision now and then can do wonders. If you’re being tested on, say, 12 weeks of content, it’ll obviously be pretty tricky to remember stuff from your first lectures if you haven’t touched it since. Just five minutes here and five minutes there. That’s all it takes. SWOTVAC/STUVAC can be pretty handy. But, of course, you always have the gloriously horrible period of SWOTVAC/STUVAC at your disposal. You shouldn’t have assessments due during this period, so you can pretty much block it out to exam revision. You can get a lot done if you put your mind to it; I tended to use the time to work on summarising my content and really nailing key concepts. Perhaps the most important thing, though (which also ties in to the point above): don’t rely on it. You never know what’s going to come up during SWOTVAC/STUVAC, so don’t put all of your revision eggs in that basket. Broader uni experiences: what have you learnt? Naturally, uni is about way more than just the academic side, and we should acknowledge that you can learn heaps about the broader university experience throughout your first semester. Perhaps even more than the academic side! One of the major things for me was literally just finding my way around campus. My uni was way bigger than my high school, and I relied on maps heaps in my first semester (well, year (well, my whole degree)). There’s no shame in that at all. There’s also no shame in asking for directions; practically everybody will know what you’re going through. Straight up, try not to be too disheartened if you’ve got through the entire semester and haven’t really met anybody. That’s cool – you still have heaps of time, and that might not have been a priority for you. It still might not be, which is also cool! But if you are looking to make some new friends, think about why it hasn’t happened yet. Have you put yourself in positions to meet new people? Clubs and societies – they’re great for this sort of thing, because you’re practically thrown into an environment with a bunch of people who share a common interest. Awesome to break the ice! Otherwise, perhaps you can make it your mission next semester to meet some people in class. A friendly “hey, how’s it going?” and then “my name’s [whatever your name is]” can lead to great things. The reality is, unis are pretty considerable institutions. There are thousands of people and, therefore, thousands of avenues to potentially get involved in exciting and cool new projects. Flicking through your uni’s website can be a good way to get more involved, as well as simply asking in person at your faculty or student service centre. For example, my uni had a pool table room below one of the buildings. I didn’t know about this until I practically had graduated. Wasted opportunity! And, of course, I couldn’t get through this article without mentioning coffee. 😉 Don’t limit yourself to what you know – shop around to see which places offer the best services!